Stretching after a workout is crucial to preventing injury and soreness, especially after leg day. Keep your gams in good working order after a super-tough leg workout with these essential lower-body stretches. Sit on the floor with your legs extended and your back straight. Bend your right knee, and bring your right foot to the inside of your left thigh. Drop your right knee to the floor. Keeping your back straight, rotate your torso toward your left leg and bend forward at the waist. Continue to bring your forehead toward your knee until you feel resistance in the left hamstring. Kneel on the floor with your hips fully extended. Step your right foot forward, directly under your knee, with your knee bent at a 90-degree angle. Keeping them square, press your hips forward, stretching the hip flexor of the left leg. Lean into the stretch, keeping your chest up, and hold. You should feel the stretch through both legs, but you will always feel it more through the front of the back leg. If you can’t, you’re turning your hips. Square them up. Repeat with your other leg. Sit on the floor with the soles of your feet pressed together, your knees bent and dropped to the floor on either side. Grasp your feet with your hands and bend forward at the waist-lead with your chest instead of your forehead or nose. Continue to lean until your abductors resist. Pull on your feet if you need to intensify the stretch. Stand with your feet shoulder-width apart, knees slightly bent, arms at your sides. Raise you arms overhead and bend forward at the waist, lowering your head toward floor. 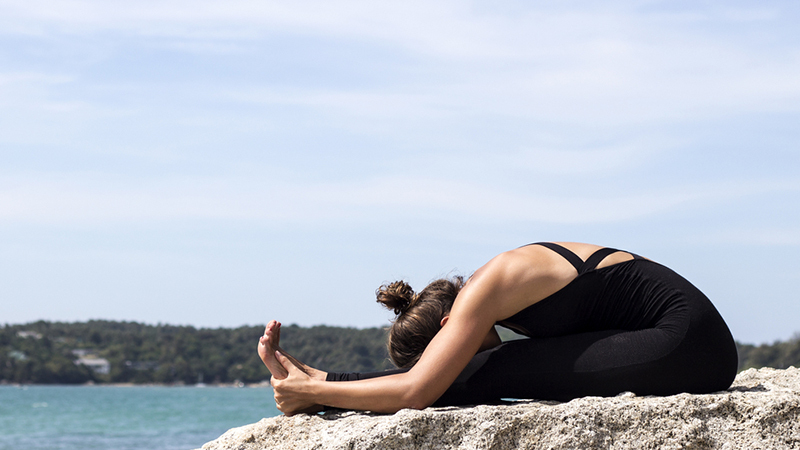 Continue to fold until your hamstrings resist, keeping your head, neck and shoulders relaxed. Hold here, feeling the stretch through the hamstrings and lower back, or for more intense stretch, wrap your arms around the top of your head, grab each elbow with the opposite hand. Feel free to slowly rock from side to side. When you’re done, bend your knees and slowly roll up to standing position. 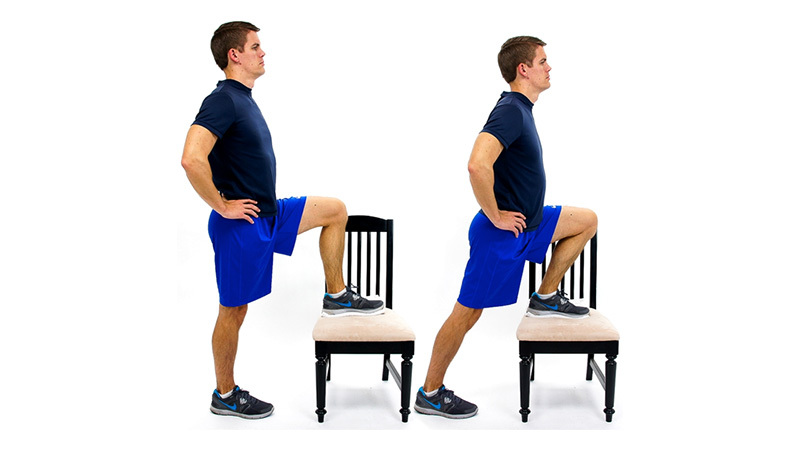 Stand facing a sturdy chair or step. Lift your right leg and place your foot on top. Place your hands on your hips and press your hips forward, leaning into the hip of the bent leg. You should feel a stretch through the hip and quad of the back leg. Hold, or to intensify the stretch, lift your right arm over your head. Lift your right leg and externally rotate the hip to place the right ankle on the left knee. Keeping your shoulder and head in contact with the ground, extend both arms and grasp the left leg behind the knee. Gently pull the left knee in toward your chest until you feel a stretch along the outside of the right thigh and hold. Your knees should be directly under your hips, hands slightly in front of your shoulders, toes turned under. Lift your knees away from the floor and straighten your legs, lifting your hips toward the ceiling. Press through your hands to shift your weight into your heels. Lower your heels until your hamstrings resist. Keep your back flat and your head between your elbows. Stand with your legs wide, almost as far as you can get, toes pointed forward. Keep your weight on your right heel, bend your right knee, lunge to the side until you feel a stretch in the left inner thigh. Sit up tall on the floor with both legs extended in front of you. Rock your hips back and forth a few times so you are on your sit bones. Keeping your knees straight and your back flat, slowly bend forward at the waist until your hamstrings resist. If you can, grasp the outsides of your feet and gently pull. Lift your chest, and fold forward at the waist, keeping your back flat. Once you’re upper body is parallel to the ground, extend your arms toward the ground. If you can, walk your hands toward your feet, folding completely at the waist, bringing your head as far as you can between your legs. Hold, then slowly release, keeping your back flat as you return to standing.